This is our cream of the crop 8 Camera Security System that features CCTV Cameras with Audio for all 8 cameras. This is an outdoor surveillance solution featuring our outdoor camera with microphone along with our Ultimate Series FULL HD 8 Camera D1 DVR with Audio Inputs that supports 8 channels of audio and video recording, and remote viewing over the internet using either a PC, iPad, iPhone, or Android Phone. 123CCTV is the only place where you will find such a high quality audio and video 8 CCTV camera recording system. The 8 camera Digital Video Recorder in this package comes with a variety of features, all of which are very user friendly. On the DVR end of this camera system, you’ll find a brand new high resolution DVR that truly exceeds expectations of today’s DVR units. This is a top of the line DVR with full D1 recording (704x480) at 30fps per camera! This is the best in the industry and with a brand new user interface, this DVR delivers easy to use menus, and it’s amazing timeline video search feature. No more confusing searching through hours of video footage. With this new timeline feature, you can easily pinpoint events quickly. This DVR comes with a 1TB Hard Drive pre installed and formatted for your convenience allowing for about 2 weeks of continuous recording for all eight cameras. Motion detection is another important feature on this DVR. It features sensitivity options, scheduling, and even motion-masking if you have an area that is triggering your motion too often. On top of motion scheduling, you can schedule this DVR to manually record all the time when you need it to. This DVR also features remote viewing not only from a PC, but from most Smartphones as well. Picture this: You are on the go, and you receive an email text notification to your Smartphone detecting motion in front of your garage. Immediately you pull up that camera on your Smartphone! It’s a false alarm, just a pesky rodent this time, but what about next time? Plus, you get FULL HD 1080 video output thanks to the HDMI video out on this DVR. For more info on this DVR, click here. The outdoor Color cameras with built-in microphone feature a 420 TVL resolution! That’s in both day and night time. On top of that they have 23 infrared LED's for night vision for a minimum of 40ft in total darkness. If you have lighting outside or there are street lamps in the view, you can see even farther. These outdoor cameras have a 6mm Lens providing a 60 degree angle of view so you can see faces from right in front of the camera and all the way up to 40ft away. Of course thanks to the wide angle of view you can see large objects in the distance as well while having a wide view of your property. For more info on these cameras, click here. 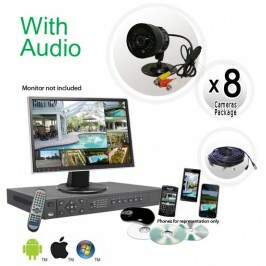 8 Security Camera System with Audio, FULL D1 Realtime 0 out of 1 5 based on ratings. user reviews.